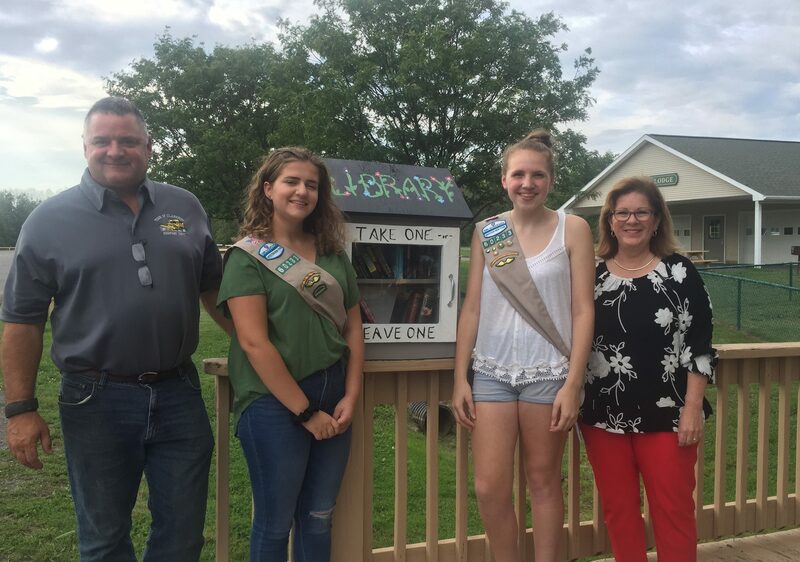 In early spring the Clarkson Town Board was approached by Girl Scout Troop 60233 with the idea of building a Little Library for the town. With this project they will achieve the Silver Award, the highest award a Girl Scout Cadette can earn, demonstrating they are leaders, organized, determined, and dedicated to improving your community. Little libraries have become popular and grew out of the simple idea of “give a book, take a book” exchanges, usually in a small enclosed case and placed in a public area for easy access by residents. As the town board meeting continued with discussion about the specifics of the project, Chad Fabry, building inspector for the town was also in attendance. He old those present that a few years prior he had purchased the former Swan Library in the Village of Albion and then generously offered to start the little library out with books from this historic building. The Town Board was enthusiastic and gladly accepted this project on behalf of the residents. Hafner Park was identified as the ideal location and Councilperson Christa Filipowicz would be the liaison for the project and assist with logistics. 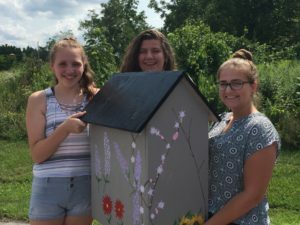 Girls Scouts Kate Bieler, McKenna Nicholls and Julia Nenni then began working on the little library. They designed the weatherproof structure details, learned to use various power tools, chalk lines, caulking and nail guns. The result is a beautifully painted little library with a park-like flower theme. The windowed door provides a glimpse at the books inside. In addition to the Clarkson library they are also building a library for Hamlin Beach that will have a beach landscape painting, and another for the Sweden Clarkson Recreation Center that will have a sports theme decor. Nenni stated there were many cookie sales to raise the money needed for the three libraries, and both Stull Lumber and Lowes donated materials and supplies. In addition, the troop wrote letters to other Girls Scout troops describing their project and asking for donations of books. 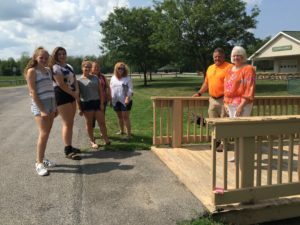 Troop leaders Vikki Nenni, Roxanne Bieler, and Renee Nicholls are proud of their troop’s accomplishments which also included the bench at the Clarkson’s Memorial Park on Ridge Road, created for their Bronze Award. Last week the completed library was delivered to Bob Viscardi, highway superintendent, for installation on the walking bridge into the childrens playground. Join us for the unveiling of the Little Library, Tuesday August 21 at 5:30PM during Good Neighbor Days.